Scorpions are way cool.. Way. Cool. They glow in the dark. How cool is that? (more on their poetic biology later). January is my month to tap into my Inner Scorpion: ferocity, tenacity, insight, and creative illumination; and to be reminded of a deep and potent power— an intensity of purpose and vision that is life-sustaining and essential: Creative Venom. I've always had a love-hate relationship with divination decks, but I'm drawn to their wide variety of art work, symbolism / metaphor, poetics, and esoteric tradition rooted in the not-so-shrouded mid-century Brit occult (and being a bit of an Anglophile: ALL THE BRIT THINGZ!). I have a pretty hefty collection of cards including classics like the Rider-Waite Tarot and Crowley's Thoth Deck; and more imaginative ones like Brian Froud's delightful The Faeries' Oracle and Ogham: The Celtic Oracle based on tree lore. But by far, my favorite is the Animal Spirit deck created by The Wild Unknown. Animal Spirit is a collection of beautifully drawn animal cards which spark the imagination and stir up inner poetry. Woo-Woo rockstar icon, Starhawk calls the sensory part of us that responds best to images, sounds and music, scents, theatre, and ritual, our Younger Self. Other Woo-Woo spirit-inclined folk call it The Fetch or Sticky One. On December 31, I created a year ahead spread. I chose 12 cards at random and one for the theme of the year. Do you have a year ahead-like spread, using images or ideas that set a focus for each month? I'd love to hear about it! Janaury's card is The Scorpion. I'm not much for traditional interpretations of cards because images have a way of speaking to us— art speaks to us— and the idea behind divination is that its power is in its poetry. 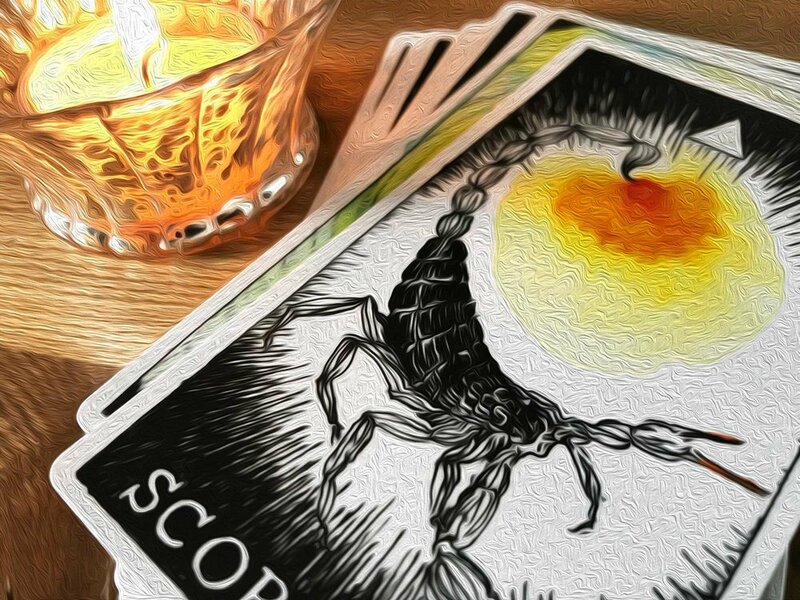 The card has a beautiful Scorpion curving to the left like a waning moon— an image associated with releasing and letting go. Although the scorpion is a creature of fire, and the moon is a water symbol— I like the idea of a potent energy release: a reminder to let go into power and insight / a letting go into trusting creative vision. The creature is surrounded by darkness, but from the tip of its stinging and poisonous tail bursts a bright light-sun-fire ball. Its poison stinger illuminates the surrounding darkness. Its darkest secret— its poison— is its power. The Scorpion harnesses its venom. At the bottom of the card, the scorpion's crab-like pinching claws, used for killing prey, sensing its environment, and defense, are red-tipped and aglow. The Scorpio sun sign of the zodiac (end of October to end November) is passionate, adventurous, spiritual, secretive, daring, competitive, determined, wild, free, and fierce. From its biology (see below), I'll add traits of tenacity, survivalism and adaptability, keen insight and intellectual, intuitive, and creative illumination and vision, knowing where to go and how to get there with directed and focussed aim, and a reserved nature. So what is Scorpion poison? How bad is it? Who is it designed to hurt? When does a Scorpion use it? There are only a few species of Scorpions that pose a serious threat to humans. The predatory arachnid only uses its poison as a last resort, preserving its precious power. It prefers to take its prey down with its fierce claws. The species is 430 million years old, and by evolution or human introduction, they're found everywhere on Planet Earth except Antarctica. Of the nearly 2000 species— all are venomous— only a couple dozen, or so, are venomous enough to do serious damage to humans. Their venom is also prey-specific, which makes them even more fascinating creatures. Some specifies' neurotoxin concoctions are used in medical tumor research: a healing poison. A scorpion's sight isn't great, "...incapable of forming sharp images, their central eyes are one of the most sensitive light receptors in the animal kingdom. Using the shadows cast by stars, thye easily navigate during night." Some even have light receptors in their tails! By star light or moonlight! So. Cool! Even cooler: they glow when exposed to ultraviolet light. They're also absurdly adaptable and can slow metabolism when food is scarce, surviving on a single insect a year— Nom! Nom! Nom! I've only seen scorpions twice: once behind a removed light switch cover, and once on the tiled bathroom floor of a lovely casita in Santa Fe. They're small creatures that strike terror into my heart with their quiet ferocity. Arthropod Diversity and Conservation in the Tropics and Sub-tropics (2016). Edited by Akshay Kumar Chakravarthy and Shakunthala Sridhara.